What if? That question has been bouncing around in my head for at least a couple of months. Though just a very few years late of personally experiencing duck and cover drills at school, my childhood was under the invisible yet omni-present threat of the Cold War. In this post-911 America, I've come to the disconcerting yet realistic conclusion that anything could happen. What if my drinking water supply was interrupted? Or there were widespread or prolonged power outages? I decided to take a more pro-active stance in the face of situations that could and sometimes do happen. A visit to ready.gov provided plenty of possibilities to my "What if" question. Tom Ridge and his U.S. Department of Homeland Security's website also offered a lot of suggestions which struck me as being responsible offerings in the spirit of the old Boy Scout motto: "Be Prepared." Besides the requisite water, food and other sundry items suggested on the DHS website, a flashlight, battery-powered radio, and extra batteries are on the list. I remembered seeing a Grundig emergency radio at a local Radio Shack store a while ago and had bought one for my Dad. 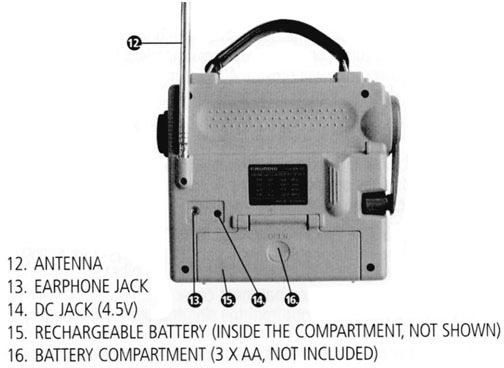 He was so pleased with it that I thought it would be a good addition to my emergency kit, as the radio sports both standard AA battery operations, but also an integral battery pack that can be recharged with the radio's built-in crank generator. The other neat feature is what is called a "touch light," an obvious mis-translation for the term "torch light" (the radio is built in China to Grundig specs). This "touch light" serves well as an emergency lighting source. AM and FM operation is what would be expected for a receiver in this general price range ($40). The AM isn't as hot as my GE SupeRadio III, but the GE's leg-up is its tuned RF circuitry, not to mention having a 50% higher price tag. Though not a super star in either AM or FM reception, there's plenty to listen to. Unless you're accustomed to those rare high performance AM/FM receivers, the Grundig FR-200 will not crimp your style. Where the Grundig really shows off is its inclusion of two shortwave bands covering 3.2-7.6 and 9.2-22 MHz. These two bands offer plenty to listen to both day and night, and all seasons. The tuning rate on the two shortwave bands is pretty fast, so it's easy to miss stations and think either nothing is on or that the radio doesn't work on shortwave. This is where the fine tuning control comes in handy. For those unfamiliar with the terms bandspread, tuning rate and the like, the best method for tuning on these bands is to s-l-o-w-l-y tune across the band with the main (large) tuning knob until you "hit" a station. Then carefully tune back across the signal for best reception clarity. Have patience, as this takes some patience and practice. 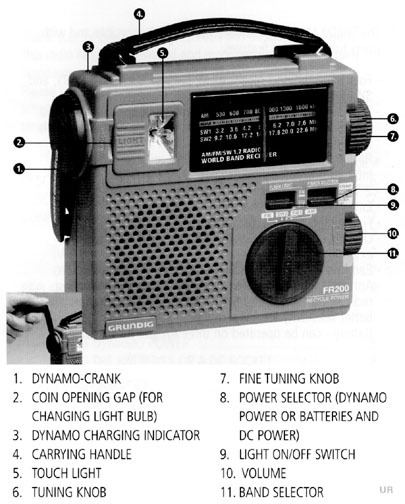 Though available from a number of on-line outlets (a search on google.com will reveal a plethora of cyberstores) this radio is also an in-stock item at Radio Shack stores. For all its features and better than expected performance, at $39.95 it's the bargain of the year as far as I'm concerned. And if that isn't enough, Grundig throws in a well built carrying case and manuals. The operating manual is well written that takes the user through the various functions and controls. The other manual, a shortwave listening guide, is an excellent introduction for the user new to the shortwaves. Both manuals fit in a compartment of the carrying case. The FR-200 with its accessories simply beg "take me along with you!" Should some interest in this little gem has been instigated, check the front and rear views of the Grundig FR-200.